MountainView Software Corporation Companion software system is designed to help companies complete and file their First Report of Injury, OSHA 200 reports, and other workers' compensation reports and claims management functions, including e-mail and EDI. 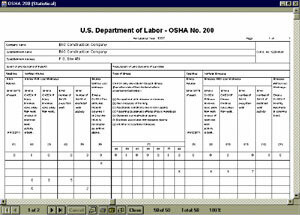 Every time the user creates a First Report of Injury in this software, OSHA 200 log reports are created automatically, eliminating the gathering and tracking of OSHA reportable injuries. This software features the ability to send claims electronically using the SMTP standard. It also has the ability to receive claims automatically using the POP3 standard on the Internet. These two capabilities make up the primary e-mail capabilities of this software. With a built-in graph and chart feature, the user can choose from seven different categories, and define the fields that need to be included. Other reports that can be run include: loss/run, audits, and claims filed by category. This software is able to export a claim, a list of employees, a list of physicians, or a list of medical facilities. In addition, it can import data from any other computer software package that can put data into a comma-quote delimited ASCII text file.